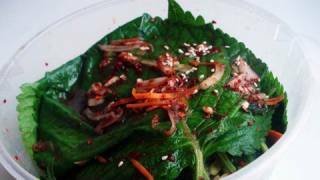 Kkaennip (perilla leaves) are one of my favorite vegetables. They have a real good flavor, like mint, so they are used for so many Korean dishes. Whatever you make with kkaennip, it will be precious dish because you will have to take care of each leaf one by one! The taste is awesome! Enjoy the flavor of each leaf while eating it with your rice! Wash and drain 135 grams (about 3 cups) of perilla leaves and put them into a basket. Next, let’s make kimchi paste! 4 cloves minced garlic, 2 chopped green onions, ¼ cup amount of sliced onion, 2 tbs of carrot cut into matchsticks, 3 tbs fish sauce, 1 -2 tbs hot pepper flakes, 1 ts honey. Spread some paste between the leaves. Put the kimchi in a container and keep it in the refrigerator. Serve with rice and sprinkle some roasted sesame seeds before serving. Posted February 5th, 2018 at 11:10 pm | Log in to reply. Posted February 17th, 2018 at 1:47 pm | Log in to reply. Posted November 16th, 2015 at 9:39 pm | Log in to reply. Posted March 1st, 2015 at 5:17 pm | Log in to reply. I have to tell you what happened last week! I guess I wasn’t concentrating at the Asian grocer last week, because I bought wild betel leaves (la lop in Vietnamese) instead of perilla leaves. I only realised when I got home, so decided to go head with the kimchi anyway. It is DELICIOUS! Obviously not like perilla kimchi at all, but delicious nonetheless. We have been enjoying it not just as a side dish, but also to wrap up small morsels of cooked meat. Mmm… SO GOOD. If ever you see wild betel leaves, I thoroughly recommend it! Posted March 2nd, 2015 at 2:52 am | Log in to reply. And that’s exactly the right use, even for the raw leaves! Thank you for the hint, I will look for those to make gochunip-muchim! Btw: ssukgat is available in Vietnamese shops, too. Posted August 6th, 2014 at 6:52 pm | Log in to reply. 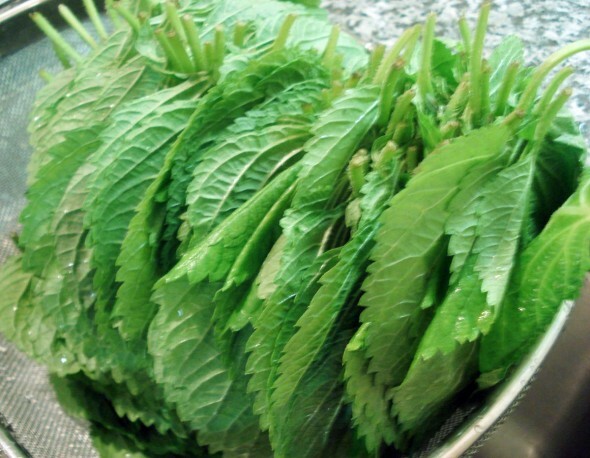 You can buy the seeds to grow Perilla leaves in almost any Korean supermarket for about 3 dollars, just ask for Kkaennip leaf seed because many Koreans do not know them as Perilla leaves. They are the easiest thing you will ever grow. Soon, I will plant my winter supply in two gallon pots, about 2 or 3 of them and grow them indoors or under porches in summer or winter, so the frost cannot get them. They grow very well in pots, if you can get them enough sun… They do not do well in full sun if you live where it gets very hot in summer, like the place I live. Mine grow the best when they are in a shaded, cooler area under a tree but get a lot of sun too. They love water, as long as it is in well draining soil and if you will remove the lower leaves so the plant can get taller and pinch the new sprouting leaves between two adult leaves, it will grow more leaves and bigger leaves too. First you want the plant to get about 2 to 3 feet tall, then you want it to get really bushy and thick. They love rich soil too. If you have rich soil that is well fertilized either organically or otherwise and the soil stays moist, you will have pick leaves at least once a week from every plant. GoodLuck! Posted June 6th, 2015 at 12:15 am | Log in to reply. Hey, glad to see some advice for encouraging the perilla plant to grow larger! I grew it for the first time last year. This year I got a wonderful surprise as last year’s plant reseeded itself – now I have five or ten plants growing in my garden, and I didn’t have to plant them! I live in southwest Missouri, USA – garden zone 6. Posted March 27th, 2014 at 12:25 am | Log in to reply. Hello! Maangchi. I made your perilla pickles two times. The pickles are always delicious:)) This time I wondered how I can cook and eat small perilla leaves. Because when I buy perilla leaves, they are with stems. So the sizes are different. I don’t want to waste of them. Do you have any suggestion for me? Thank you, 잘 부탁합니다. Posted March 27th, 2014 at 1:20 pm | Log in to reply. If the stems are soft enough to eat, blanch them with the leaves and stir fry them with garlic, onions, and soy sauce. If the leaves are large, they will be too tough to eat, so pick the leaves and make kimchi or pickles with them. Posted March 27th, 2014 at 6:01 pm | Log in to reply. Posted January 3rd, 2014 at 1:00 am | Log in to reply. I made kkaenip kimchi with leftover kimchi paste. It was delicious but in 2 weeks time I found fuzzy mold! I had to throw away. What happened? Why did it get moldy? I kept it in airtight glass container in fridge.! Posted March 27th, 2014 at 12:51 pm | Log in to reply. oh, it sometimes happens. To prevent it, you can make it more salty and keep it in the fridge. Or a few days later it’s made, pour out the juice into a pot and boil it again. Then cool down the juice and put it back to the container. Press the top down with a spoon so that the kkaennip will be submerged in the juice. Posted August 30th, 2013 at 3:48 am | Log in to reply. I am a fan of Korean dishes. Especially Kimchi and Sam Guip Sal. I live in Ortigas, Philippines. 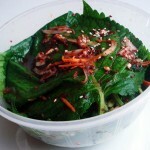 I just like to know if there any Korean grocery sell Perilla Leaves in Ortigas.. I like to try making Kkaenip-kimchi. Posted August 30th, 2013 at 9:36 am | Log in to reply. Posted October 17th, 2012 at 10:40 pm | Log in to reply. Posted April 22nd, 2012 at 1:11 pm | Log in to reply. I’m going to try making the kkaennip kimchi today! Yesterday I bought perilla for the first time :) it’s only available seasonally at the Korean market I like to shop in. The owner gave me a discount because some of the leaves had darkened–are those okay to use (just not pretty) or are they not usable? Thanks, Maangchi! Posted April 23rd, 2012 at 9:32 am | Log in to reply. “some of the leaves had darkened–are those okay to use..” Perilla leaves are easily going bad. It has to be used soon after picking. I wouldn’t use the leaves with dark spots. Posted April 7th, 2012 at 11:29 pm | Log in to reply. Posted April 8th, 2012 at 5:15 pm | Log in to reply. Posted October 26th, 2011 at 12:15 pm | Log in to reply. The perilla leaf pickles are so delicious! I made little bundles of the pickled leaves stuffed with rice and tofu for my lunch box. Thank you, Maangchi. Posted October 26th, 2011 at 12:25 pm | Log in to reply.